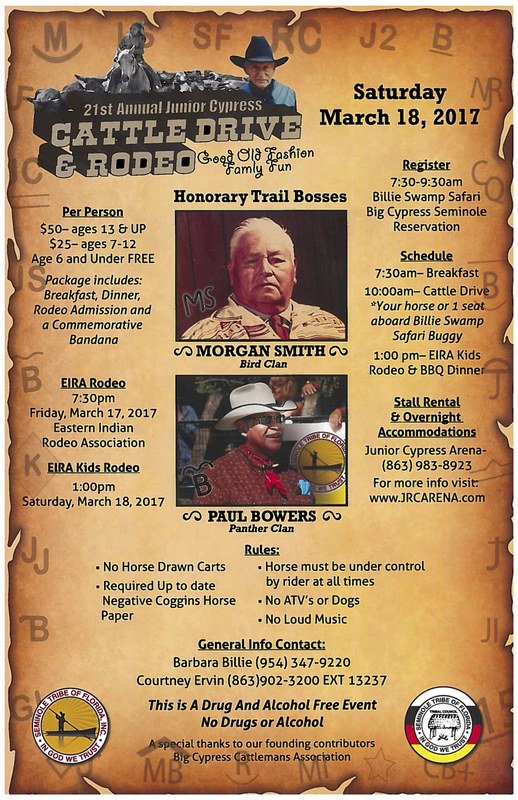 The 21th Annual Junior Cypress Cattle Drive & Rodeo will be held March 18, 2017. This year’s cattle drive route will begin at the front parking lot of Billie Swamp Safari at 10am and take route down West Boundary road onto Josie Billie Hwy to the Junior Cypress Rodeo Arena. This event will effect traffic flow temporarily, between the hours of 10am and 12pm on West Boundary Road and Josie Billie Hwy/Snake Road. Spectators are free, or register between 7:30am – 9:30am in the front parking lot at Billie Swamp Safari to ride aboard a Swamp Buggy, $50 adults, $25 kids; breakfast, BBQ Lunch and Rodeos are included.